Welcome Home to The Farm at 2951 TODDS POINT ROAD distinctive property that will meet your every need of EASY modern farmhouse living. Meticulously maintained, designed with open and inviting floor plan and built with quality amenities. Flat and rolling Paddocked acres and Horse Barn. Home situated just on a rise with sunrise and sunset views surrounded by distant farms. 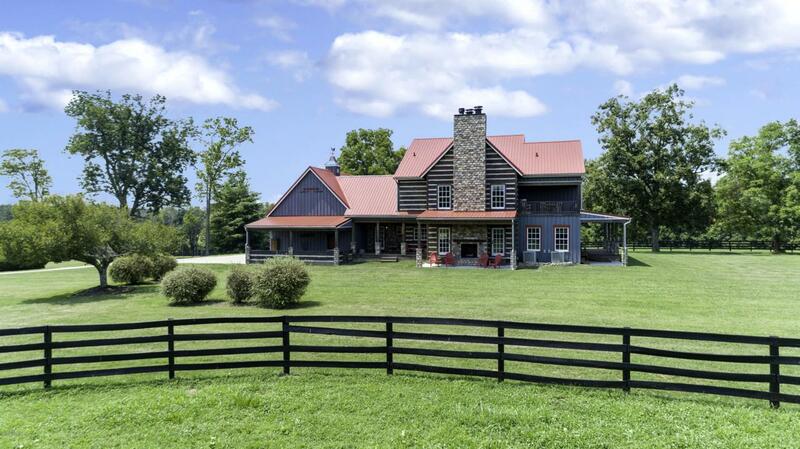 You and your horses will Enjoy a newer Custom Built Modern Farmhouse with reclaimed natural materials with 'rustic appeal. 4 bedrooms, 3 full and 2 half baths, over 5,288 finished sqft, includes 1,370 sqft in Lower Level, excludes 1,388 unfinished sqft. Horse Barn 1,850sqft. 15.5 ACRES. 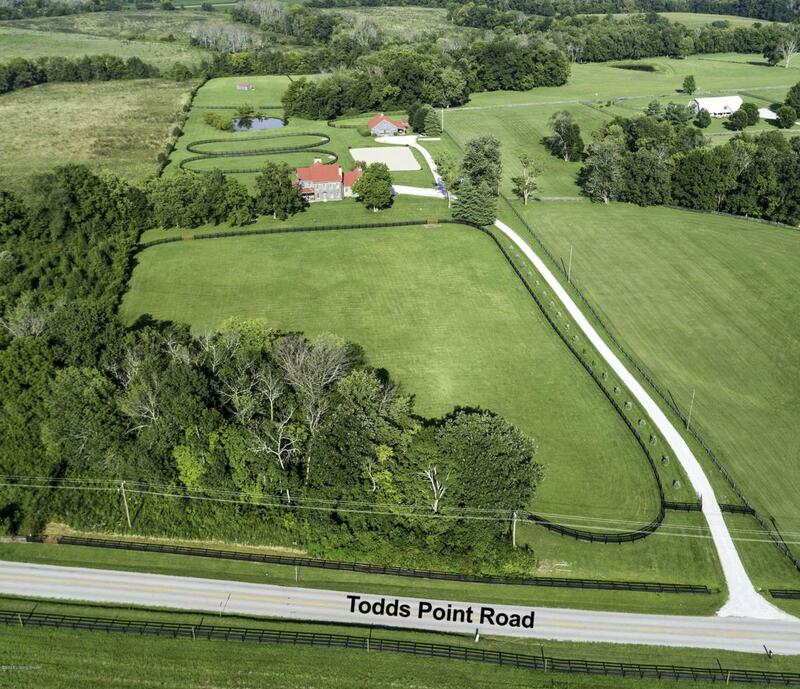 Location and Convenience; Perfect for eventers, fox hunters, breeding, hunters, jumpers & ranch downsizers all in the heart of SHELBYVILLESaddlebred country. 30 minutes to Churchill Downs and 45 minutes to Kentucky Horse Park. Home wrapped in porches, with charming two-story ENTRY FOYER, 2 Pet friendly Mud Rooms, Open concept Cooks KITCHEN with farm sink/Breakfast Island/FAMILY ROOM with fireplace and Inviting DINING AREA with fireplace. Includes a FIRST FLOOR EN-SUITE and SECOND FLOOR VAULTED MASTER SUITE with his/hers dressing, sitting room and beamed ceiling and fireplace. 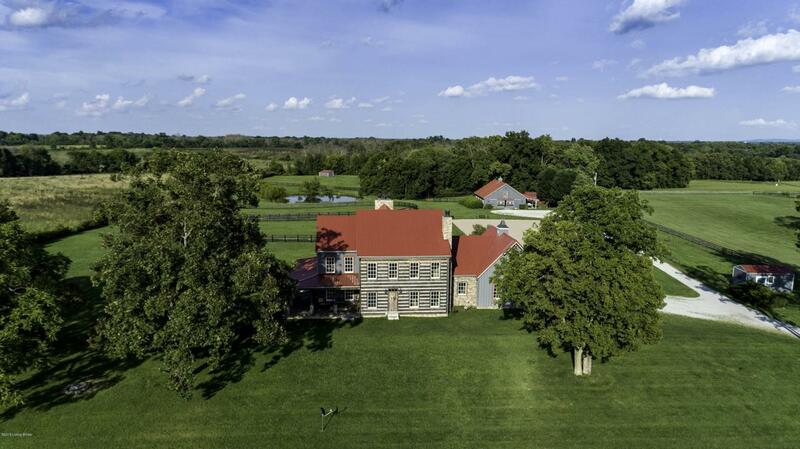 Plus, 14x15 his and hers closet, bonus seasonal storage area and private covered porch overlooking the eastern paddocks and barn.Two additional Second floor bedrooms. FINISHED LL designed specifically for the cave man,poker player and fantasy football entrepreneur. Well-executed Horse barn with 5 stalls, 2 sized for warmblood or brood mare, hot and cold wash rack, 6x12 tack room, feed area, hay loft. Outdoor sand arena, fresh water pond, shaving area with concrete pads, two 12x24 matted run-in sheds (with electric), covered implement area, 2+ car garage with carriage barn boors and oversized carport. Only the finest materials were used. Additional features include; Farmhouse Red Standing Seam Metal Roof, 8" inch galvanized gutters, 250 yr old spindles hand milled staircase railing, hand made barn doors on all closets, Dutch doors, reclaimed brick floors, hart pine reclaimed hardwood floors, wool carpets, baths and laundry with ceramic stone, reclaimed wood accent walls, iron chandeliers. Custom cabinets, bath vanities and counter tops by Benner 's Woodworking in Lebanon, Ohio. All bath vanities are furniture quality designed and built. Featured Pioneer Log Siding is Washington State Frazier Fir hand-hewn, distressed, axed, sculpted, sawed, sanded then age-stained to appear over 150 years old. providing a log cabin chinking look. Rooms are all cable ready, floor to ceiling fireplace hearth masonry. Paddocks all with Black 4 Board fencing, ___sand ring with sand footing. 5 frost free water spickets. Fences repainted July 2018, age of barn roof original 1992. Appraised footprint included. UTILITIES: Propane gas (Tank is across the driveway with above ground tank, Suburban Gas Company) 2/6/18-$659, 3/19/18- 536.07, 9/19/18- 359.25, Average Water bills $40/month, One water meter, Rumpke Dumpster Contract 1 yard $56/mo 1x week on Wednesday . Must see MULTIPLE PHOTOS and video for all Details. 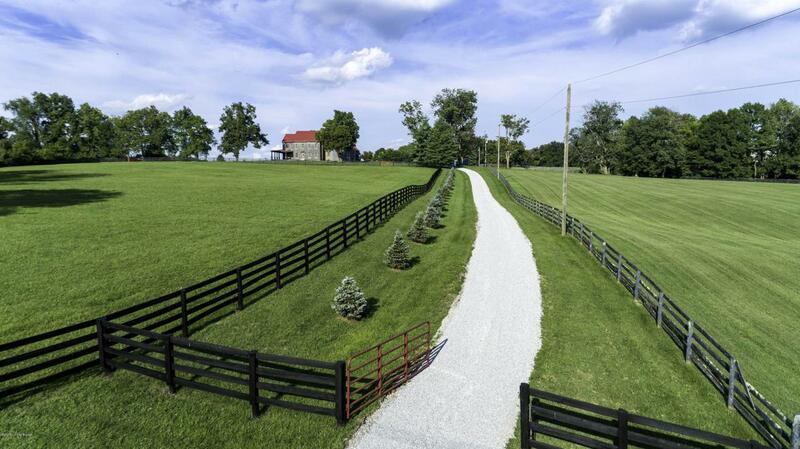 A lovely 'right-sized' farm to call your Kentucky Home! Half Bath Remarks Yes The Mirror Remains!